Several people have asked for information about families who still do or used to be in the area. If you can help, please send the details to rossonwye@googlemail.com and I will pass it on. Questions/requests for information (and answers) on families, people or places can now be posted on the Information Request System [ here ]. Hi folks, we're seeking information on bungalows so we can move forward in search for relatives. 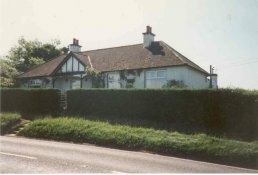 The bungalow, picture included, was taken a few years back and is circa half a mile down the A49 (off the A40) on the left hand side. We’re seeking the road name and bungalow number with if possible the present owner’s name so we can write to them or of course they can contact me direct. The second bungalow of interest to us, no picture, was up to the 60’s at least, just around the corner on the B4521 (off the A49). The significance of both abodes is the connection they and we had as a family up to circa the 70's with Abergavenny relatives. Any snippets of info will most certainly help thanks. Hope you can help, known names are King/Mathews/Pettey/Edwards and Jean/Joan believed to be bus driver or post worker living at the B4521 bungalow. I was emailing a an old school friend who mentioned that they may be a possibility you have a copy of a year photograph [unfortunately I don't] that I would like a copy of. I lost my copy many years ago now and when I contacted JKHS about it they told me they no longer kept copies (real shame!) 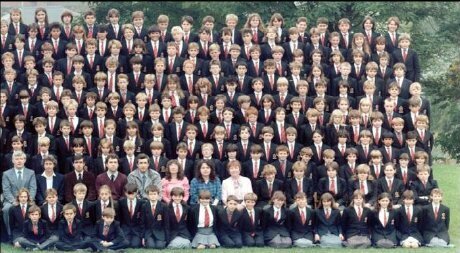 Do you have a copy of the first and second years pictured at the what is now the Larrupez but was the lower site (in 1986)? I attended the school between 86-91 and was the only year to be based in the three sites. It would be great if you could help with this, if you don't have a copy, would you know of anyone that may do? 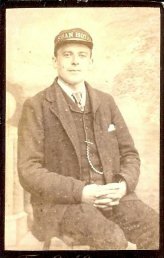 "My father owned Harper and Sons, the moving company that still exists in Ross, and I am trying to find a photograph of him (his name was Cuthbert Harper)." 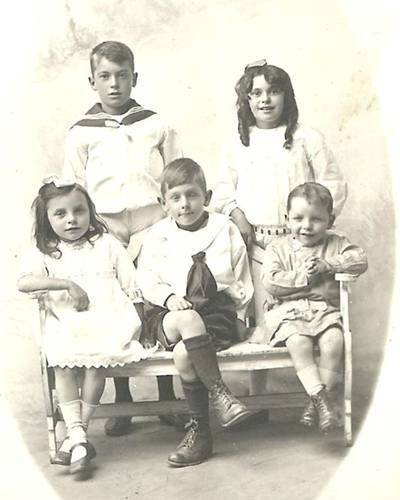 "My family came to Ross in around 1900, and became tailors. Does anyone have any details about where they worked in Ross? Did they have a shop? I have looked in various records and the details are unclear." My father was born in Lower Greytree the only son of Mary & Tom Cooper. His cousins the Davies’s lived in Nursery Lane. I have traced all the family except for the daughter of William & Winifred Davies who lived at Craigmore, Over Ross St. Grace married probably some time in the late 1950s & went to live in Gloucester. She had some children. I would love to get in touch with them just to say hello. These some memories from his late father, Alex Cooper, that may help. William or “Bul” married Winifred, or May as she was better known, and they lived all their married life in Over Ross St. His hobby was being part of a barbershop duo with the son of Ursell’s monumental mason. They had one child, a very pretty girl called Grace, who married and went to live in Gloucester. Front Molly & George Davies with Alex Cooper in the middle. This photo shows Jack Davies who was Grace’s grandfather. Jack used to work on Ross Railway Station, but before that he was a porter/boot boy at the Swan Hotel in Ross (hence his hat). My Gt Gt Gt Grandparents lived in Overross Pike and on the 1861 census Richard Evans was a Turnpike Gate Keeper at Overross. They also lived in Tankard Street but I could not find this Street on the site. My 3x Gt Grandparents were named Richard Evans & Ann Jenkins. On the marriage certificate November 1845 it states that Richard lived at Tankard Street and Ann was from The Folly. On the 1851 census it gives an address of Trueland Street. On the 1861 Census it say occupation Turnpike Gate keeper address Overross pike, Folly, Ross Foreign, Ross. I also have the census for 1841 4x Gt Grandparents William Evans wife Hannah that also gives the address Tankard Street Ross he was a Housekeeper. I wish I could give you more information. I don't know if the rg number of the census form will tell you anything ,its HO107. I would appreciate it very much if you do find out anything and let me know. I am trying to trace my great grandfather Kyrle Earnley Gordon born in Ross about 1839. His father's name was Thomas. He married Eliza Webb in 1866 and then lived in Kent. My great grandfather Kyrle was a Master Tailor and according to his marriage certificate(1866) his father Thomas was a Stone Mason. An old aunt thought Kyrle had a brother who attended the Bluecoat School in Ross. This is all I know about him. I am looking for family information on the BRAD and HUNT families that lived in the Ross district in 1841-1861 and possibly still reside in the area. I am a descendant of William Brad and Sophia Hunt, who married in 1840 Cheltenham and had one child Sophia Elizabeth born 1840 in Ross, Herefordshire. William joined the European Indian Battalion in 1842 moving his family to India where 2 possibly 3 more children were born. In 1851 the surviving children, Sophia and George were sent to live in Ross with their Hunt grandparents. Between 1851 and 1861 William’s wife Sophia returned to Ross and is listed in the 1861 census as head with George living on Nursery street or road in the Ross parish. William retired from the military in 1861 serving his full 20 years and was to return to England sometime after April 1861 as a pensioned soldier. This is where I lose William, I believe he returned to his family in Ross and would have collected his pension at the local pay office. I’m not sure if William died returning to England in 1861 or if he died between 1861 and 1871 when his wife Sophia appears in the 1871 census as widowed. Later in 1871 Sophia comes to Canada to meet her son George who immigrated in 1869, they eventually end up in Manitoba where the Brad’s continue to live. I would like to know if there are any records kept in the Ross district that may indicate William’s return or death, if the records are correct I suspect his death would be between 1861 and 1871. I am also interested in any remaining Brad’s or Hunt’s that may still live in Ross who would be interested in contacting a possible descendant in Canada. I have recently acquired Williams war records from India and would love to share them or exchange information. If you have any ideas or help in my search for William it would be greatly appreciated. If you have any interesting information and would not mind sharing it, please let me know using the form below.